Lucy Jeal was the youngest performer chosen by BBC Radio 3 to play in their 1995 "Young Artists' Forum" recorded concerts. at the National Portrait Gallery. Lucy has played with Alfred Brendel throughout Europe and in Japan and was a young artist for the Countess of Munster Trust in 1991 and 2000. Lucy has also performed as a concert soloist throughout the UK and in Moscow, and she has given recitals for many music societies in the UK and Germany. She was a member of the Royal Northern Sinfonia. Sasho Somov studied at the Guildhall School of Music and has won several national competitions. He has performed to critical acclaim concertos by Dvorak, Schumann, Shostakovich, Prokofiev, Elgar, Tchaikovsky, Haydn, Strauss, Beethoven, Brahms, Gulda and Turnage, with orchestras including the Philharmonia, the Royal Northern Sinfonia, the Strasbourg Philharmonic, Stadtkapelle Achern and the Bulgarian National Radio Symphony. He was the Principal cellist of the Royal Northern Sinfonia from 2000 and in 2006 took up the position of Violoncelle Super Soliste of the Strasbourg Philharmonic Orchestra. Va i Ve have performed throughout the United Kingdom, both on two pianos and as a piano duet. 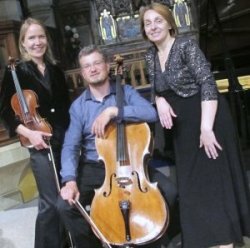 Their repertoire includes Rachmaninov, Benjamin Britten, Liszt, Henryk Pachulski, transcriptions and original works by Bulgarian composers and Piazolla. 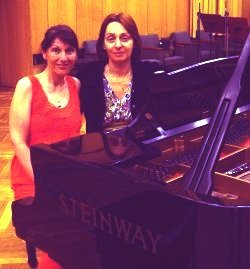 Both Valentina and Venera were students Liubomir Dinolov in Sofia, one of Bulgaria's foremost pianists and their performances represent a uniquely conjoined vision of some of the major repertoire for two pianos.